When you consider all the work Maurizio Sarri puts into getting ready for a match, it makes a little more sense that the anxious magician winds up with odd habits like chewing on cigarettes during the game. 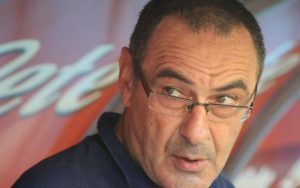 The Chelsea boss, 59, gave an interview to Corriere dello Sport where he admits he spends 10 hours a day getting ready for matches, (perhaps) joking that he doesn’t allow himself to be disturbed. “I got a house… in Effingham, so they lock me up in my hermitic seal and if they knock, I don’t answer the door. I am immersed in my world. Sarri had 16 (sixteen!) jobs before he got a chance at even the Serie B level in Italy, but has now led Empoli to Serie A promotion and safety before guiding Napoli to wins in nearly two-thirds of their matches. He’s only unbeaten at Chelsea, which seems an impossible standard to keep up.